China and the Arab League issued a joint pledge yesterday to expand their annual trade to US$100 billion by 2010 as they wrapped up a two-day conference meant to strengthen all-round ties. Chinese Foreign Minister Li Zhaoxing signed a two-year plan for the Sino-Arab Cooperation Forum with Secretary General Amr Mahmoud Moussa of the Arab League. 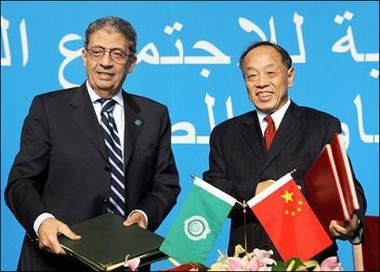 The action plan for Sino-Arab cooperation between 2006 and 2008 included plans for a bilateral meeting to focus on oil issues and "a dialogue mechanism" to further promote energy cooperation. The forum also made a pledge to further cooperation in the battle against terrorism. "China and Arab states condemn terrorism of any form and oppose linking up terrorism with certain nationality or religion," the statement said. China's trade with the Arab world has grown tenfold over the past decade, to US$51.3 billion, about 40 percent of which is oil related. Trade volumes between the two sides could double to as much as US$100 billion in 2010 by facilitating the free flow of goods, capital, technology and service, State Councilor Tang Jiaxuan said on Wednesday. Moussa said current trade volumes were "just a beginning" and that the two sides might even reach their US$100 billion trade target within "two to three years" if they maintained recent growth levels. China and Arab states will hold their first meeting on oil issue at some time between this year and 2008, according to the action plan. "The two sides attach importance to energy cooperation, particularly the cooperation in the sectors of oil, natural gas and renewable energy," the action plan stated. · AL chief terms Arab-Chinese relations "strategic"